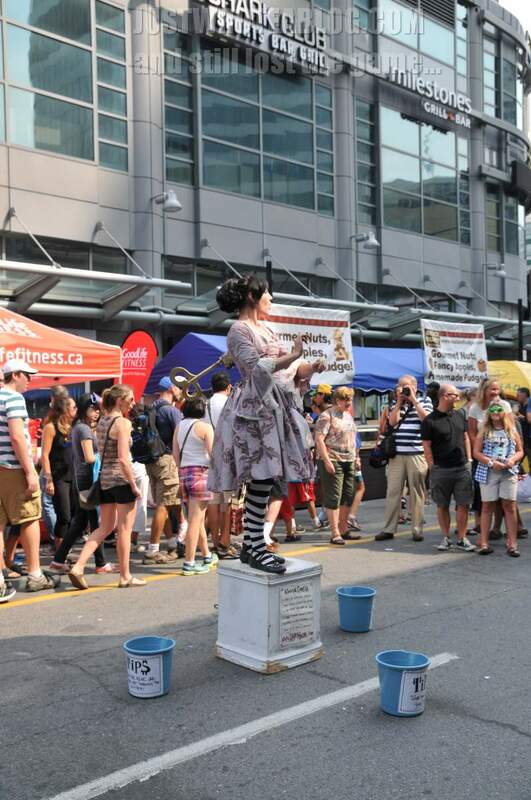 Digital Follies – The 2015 Toronto Buskerfest! 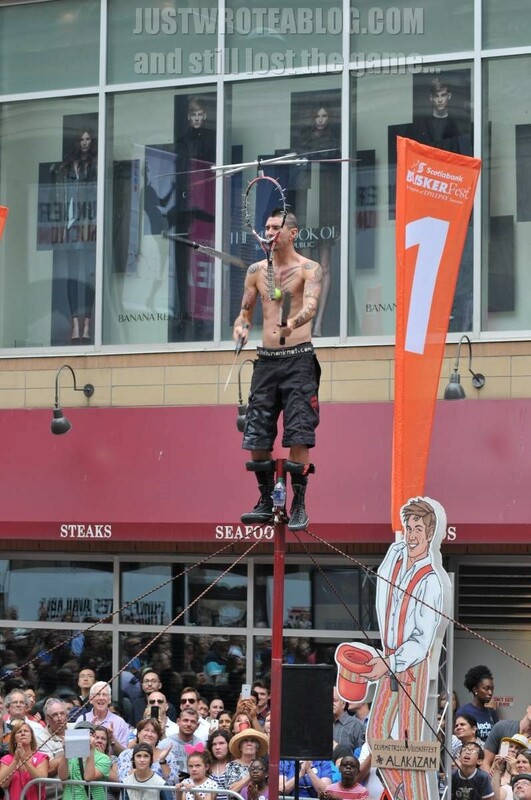 I’ve managed to run around Downtown Toronto on Saturday to watch some of the street performers at the Scotiabank Buskerfest. As you know from my Saturday post, this event (the largest of its kind in North America) ran all weekend. 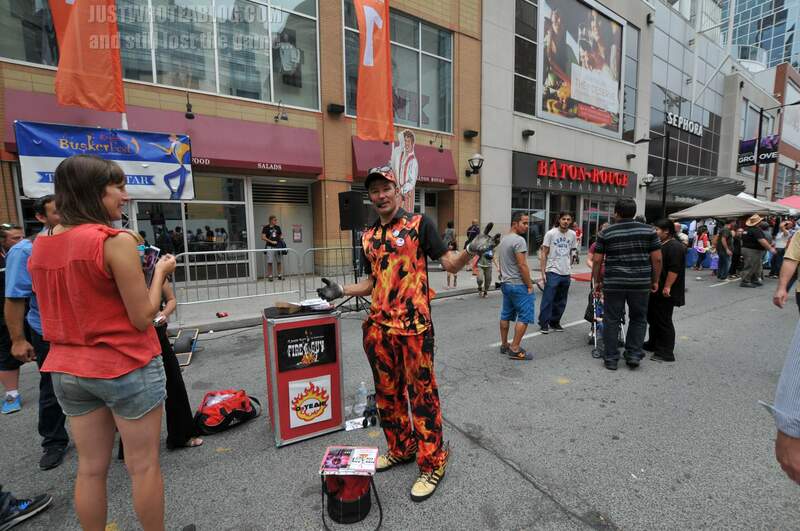 Proceeds from the event were donated to Epilepsy Toronto. #donateateatthegate. 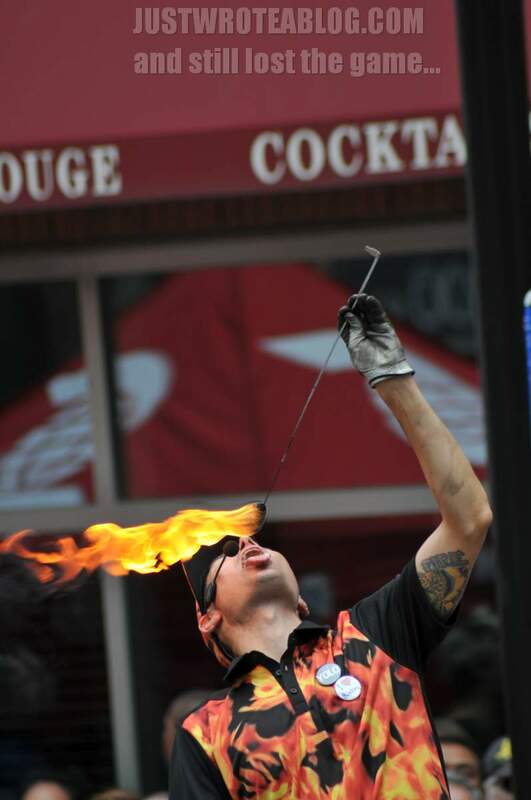 Billions Cobra, wowing a huge crowd with his fire whip. This is likely my favourite action shot of the year. 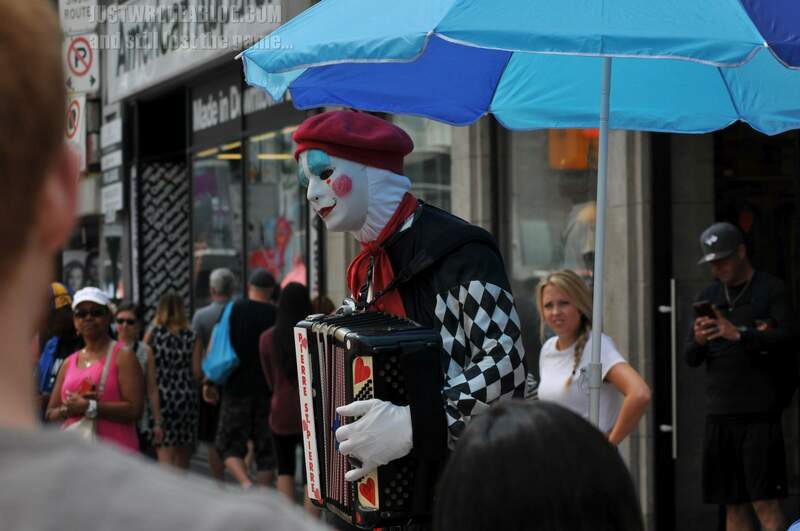 For this walkaround, I was using my girlfriend’s Nikon D300. It was mated to a Tamron 17-50/2.8 as well as the Nikon “Beer Can”, also known as the 70-300/4.5-5.6G – a very underrated lens which I find perfect for amateur photographers who are still learning what their camera can do. These photos came straight from the camera and were untouched – other than resizing, watermark and jpeg compression for web. 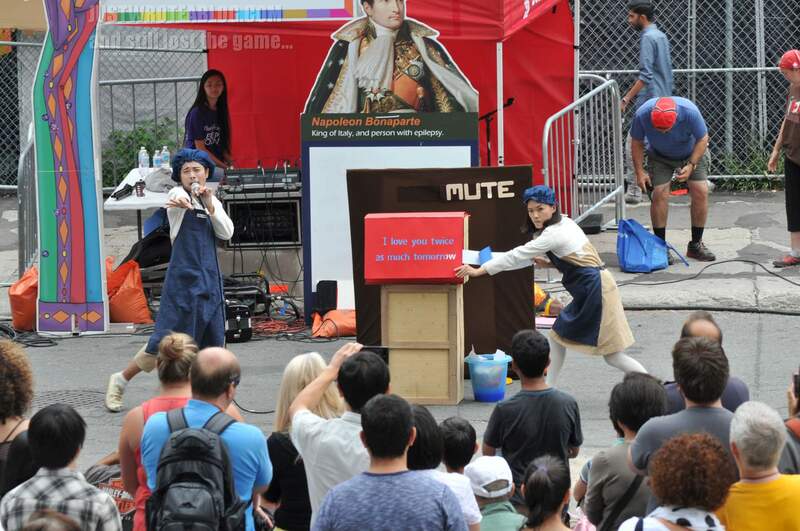 “Mute”, a funny duo from Taiwan, performing a mime act that made the crowd laugh. Loved the stories they tell, without speaking a word. As my thank you for allowing me to take their photos during this “free” event, I am forwarding my photos to the performers without watermarks, but I appreciate if you please do not use/re-post these photos without their express permission. 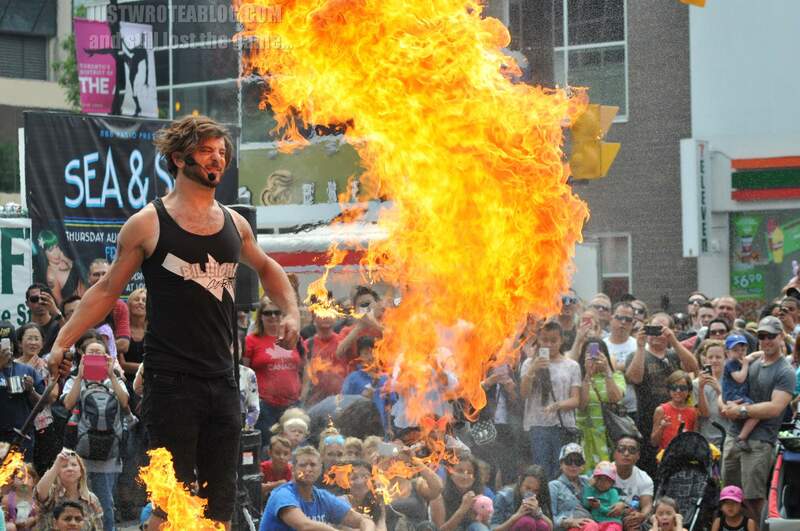 I will post links to the performer’s websites later today, but please find info about them at the Toronto Buskerfest Homepage, and clicking on the “Performers” link. 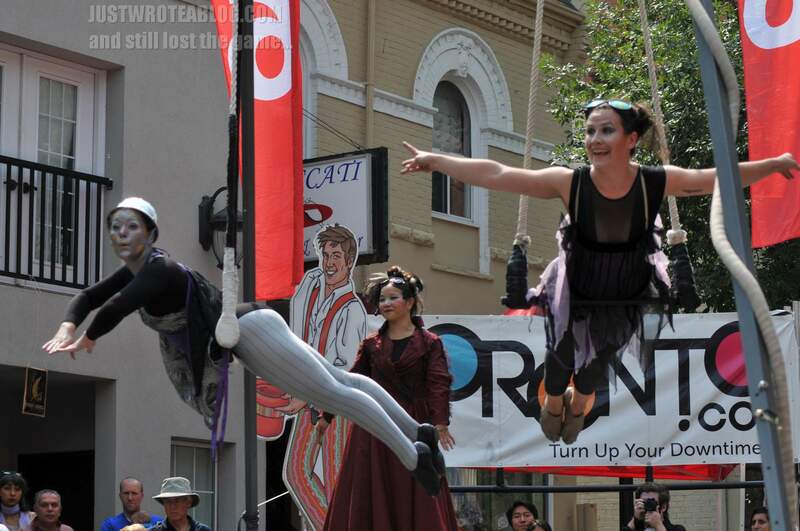 “The Flying Machine” from Herciniarts Collective performed a trapeze act had many kids in awe. 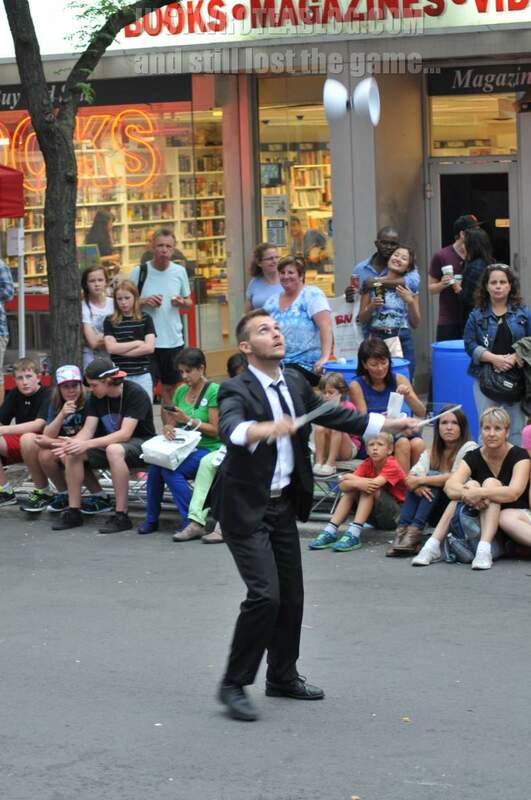 The stilt walker in the centre was a storyteller who entertained the kid and adult spectators. 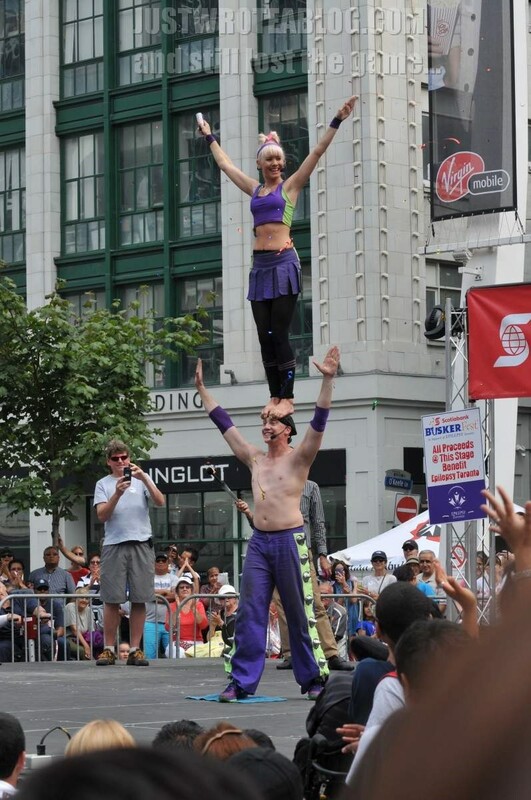 Tarrabelle and Rusty of Zap Circus travelled all the way from Australia to perform their acrobatic stunts on Centre Stage at Yonge-Dundas Square! 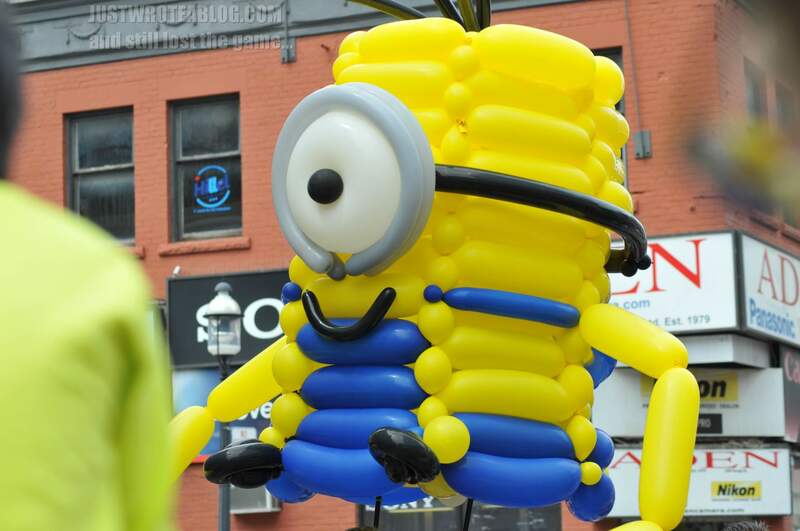 The Twisted Ones were in town showing off their balloon creations! 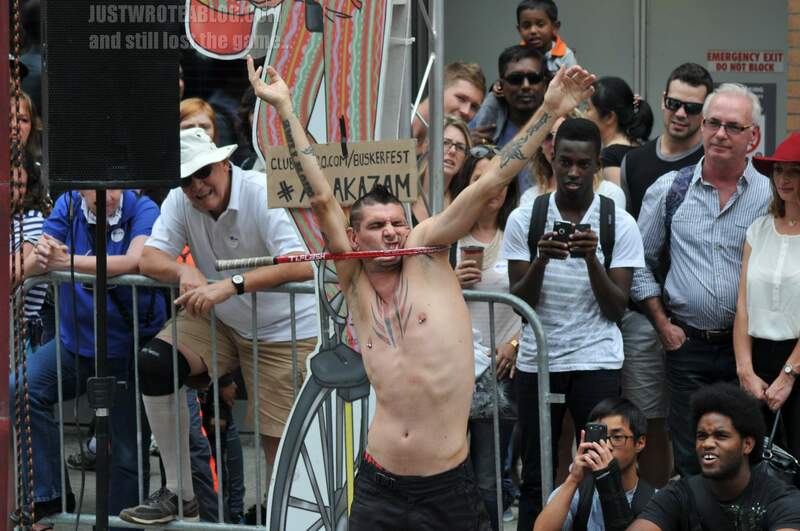 Alakazam is juggling machetes, holding a tennis racquet in his mouth that has nails all over it and a contraption balanced on the racquet spinning knives. AND he’s standing on a pole 12 feet in the air. Even though they can get very tired after a show, many of the performers will always welcome a photo op. 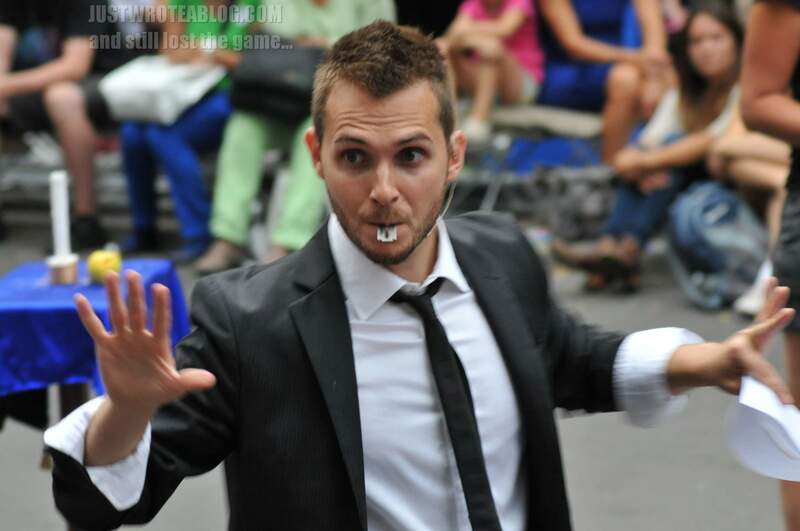 Pierre St. Pierre performing a musical number. 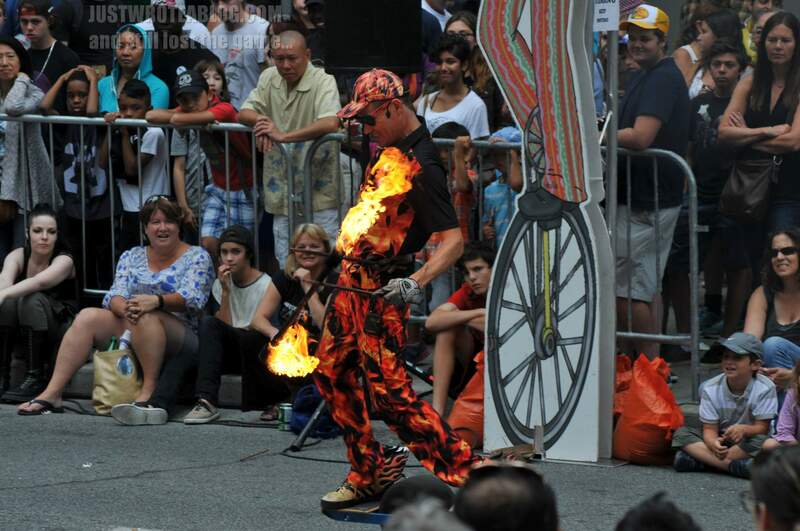 Fireguy playing with the devil sticks, one arm behind his back, while on his motorized one-wheel skateboard. 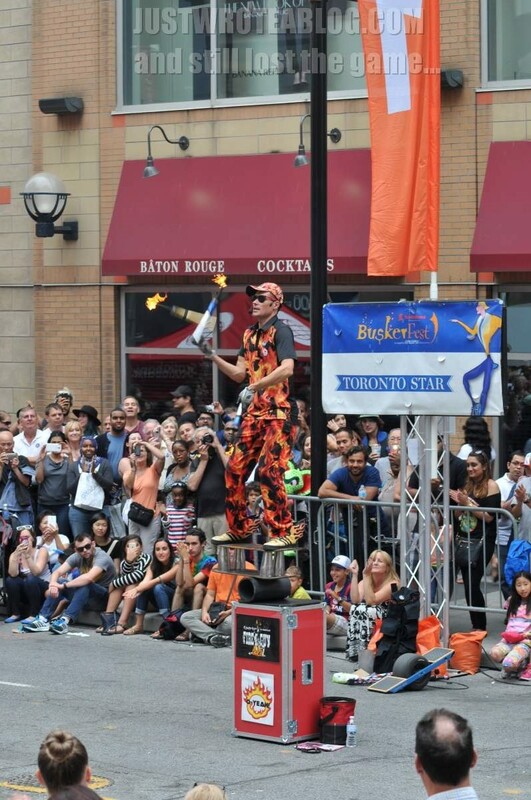 Yes, this is crazy…from bottom to top, a box, an ABS pipe, a board, what appear to be 4 martini shakers another board and Fireguy juggling torches. How does he do it? It’s gotta be the shoes! The foodie in me should’ve asked what fire tastes like? See! They love to smile for the cameras! Kate Mior makes an appearance as Coppelia. 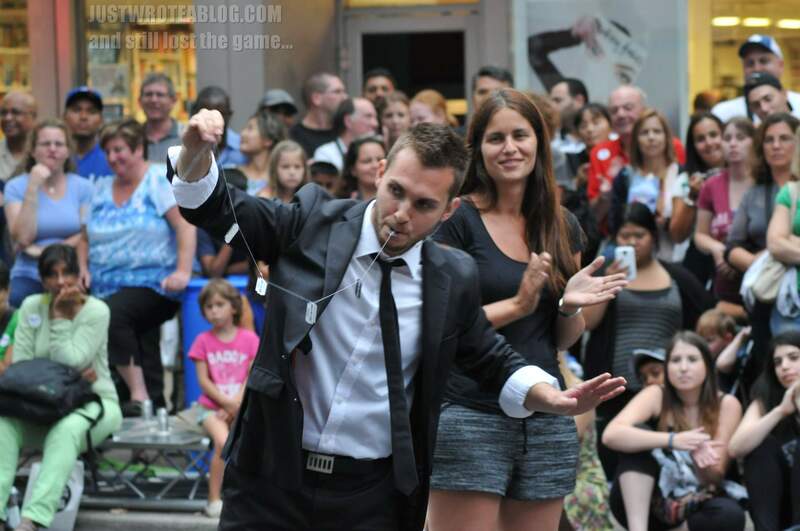 Nathaniel Rankin warming up the crowd with a few tricks. He was already moving pretty fast for my camera. To take this and other shots of Nathaniel, I had to perch myself on my bike, leaned on a tree. People kept bumping me and the bike…blurry shots were the result. “Is this your ring tied on my shoe, sir?” The man and the crowd are in disbelief. Flashlight focused into his mouth and throat…you don’t see the razors, right? I just swallowed 5 of them. Nathaniel takes a piece of string and swallows it while holding one end. Then starts to pull…YIKES!! 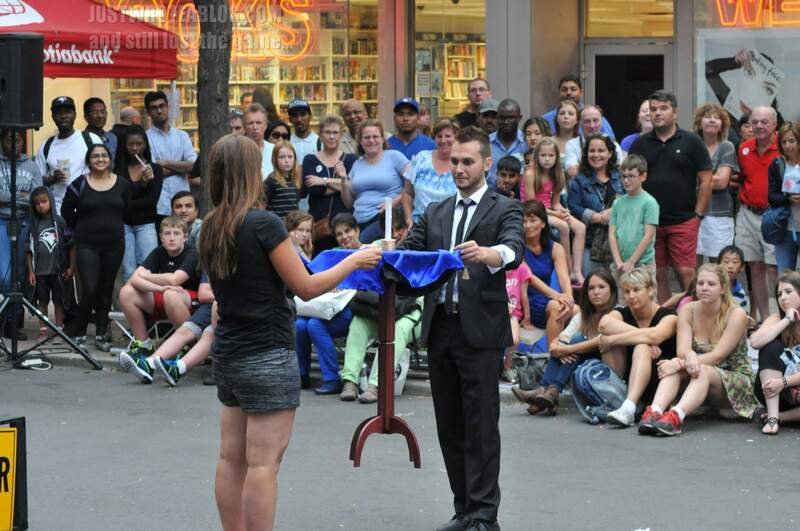 The mystery of the floating table…I’m just dumbfounded! 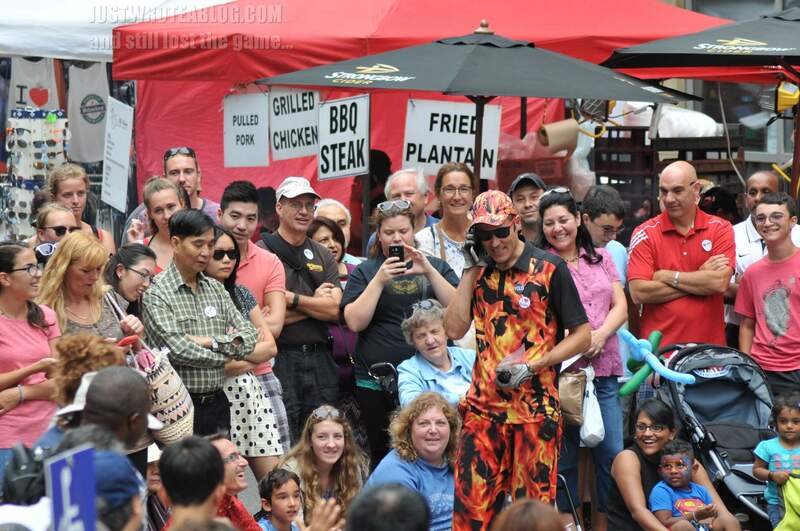 ← It’s A Weekend Thing – 2015 Toronto Buskerfest! I was there the whole day. How did I manage to still miss some of the acts? lol. 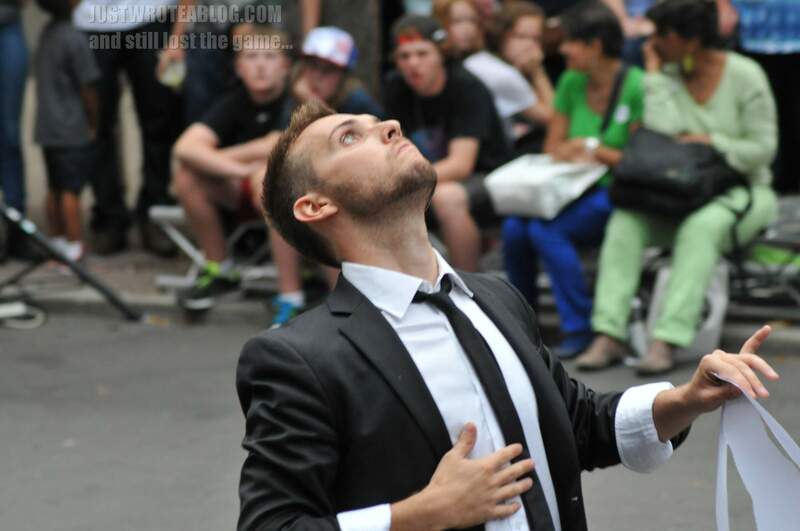 Like that tennis trick with nails …crazy! There is a board posted at each entrance listing down the schedule performances at the stages spread out along Yonge Street. Some of the stages you have to be there really early in order to get a good spot to watch or take photos.